A truly magnificent survival from the reign of Charles 1...an Oak Joyned Refectory Table of the size that I have not seen before...only 5 ft in length and it has never been shortened or messed about with , as so many were from that period. Glorious natural colour, it would grace any period house or cottage...a real rare chance to buy a piece of history at a great price! 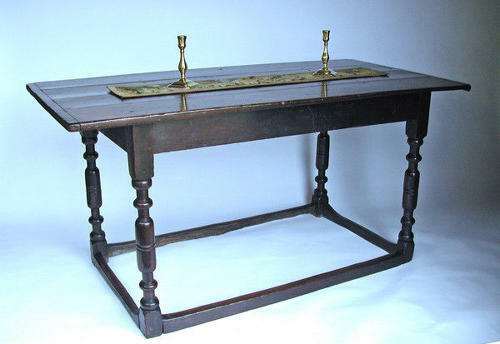 See " Oak Furniture - The British Tradition" by Victor Chinnery for similar larger examples. Original apart from it has lost about an inch in height as it has stood on stone floors.